Hazel: "Read between th' middle fingers: it's DENNIS, Fucko!" ...& one of 'em got away from her! 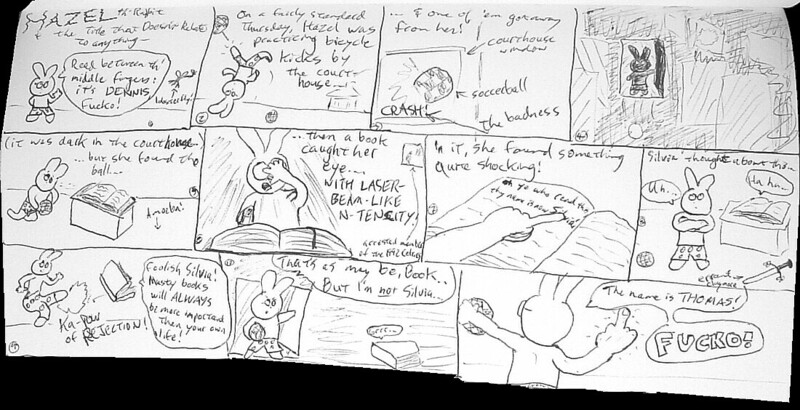 ...then a book caught her eye...WITH LASER-BEAM-LIKE N-TENCITY! In it, she found something quite shocking! Oh ye who read this, thy new name is now Silvia! Book: "Foolish Silvia! Musty books will ALWAYS be more important than your own life!" Silvia: "That's as may be, Book...But I'm not Silvia..."
Silvia: "The name is THOMAS! FUCKO!"